The engine No. 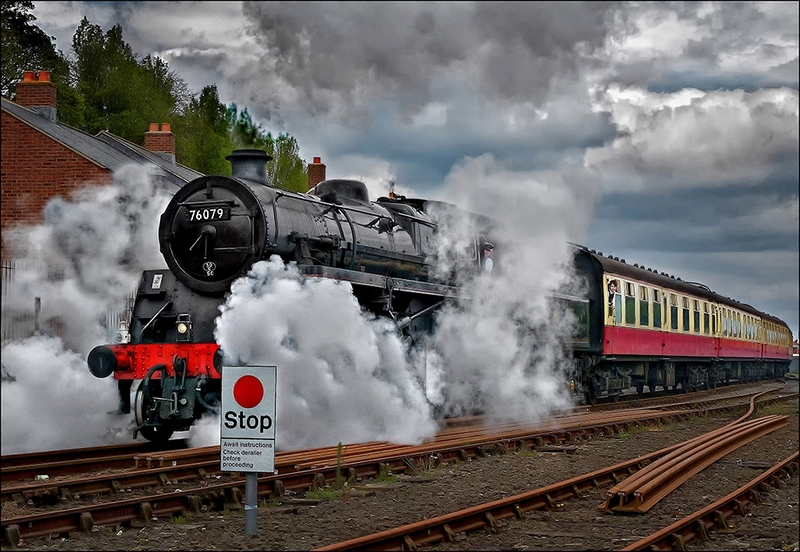 76079 is the BR Standard Class 4MT that is a regular on the North Yorkshire Moors Railway. Caught it just leaving Whitby for one of it's regular runs. That’s a really steamy pic John ... I actually rather like the stop sign ... yeah I think it actually adds to the pic ... and I suspect you like it too as it is removable if you wanted to eliminate it ..
i get a real sense of drama and energy in this image, good photo. Thanks Rye, thanks Clicks, thanks Paul. I thought that the stop sign was part of the furniture so to speak and didn't really consider removing it. Clicks, I was lucky with the steam. I had positioned myself just inside a crossing gate where technically I shouldn't have been but there were three tracks between me and the one shown so I risked it. The train was stopped waiting for a signal and when the driver looked straight at me I thought I was in trouble so I waved in acknowledgement. He took it as a signal and gave me a nice burst of steam. I always wanted to be a train driver. They are such nice people. There's oft times on the ELR at various footpath crossings that I've been a lot closer, I always wave to let them know I've seen them.